On receiving news of the prize, Professor van Loosdrecht said: "I'm very excited and pleased! This is a recognition not just of our work but of the contributions microbiological engineering can make to the water sector". 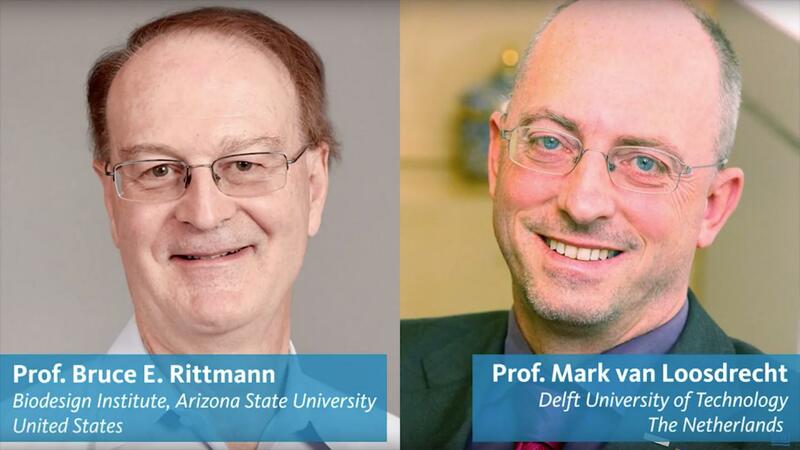 In its citation, the Stockholm Water Prize Nominating Committee recognizes Professors Rittmann and van Loosdrecht for "pioneering and leading the development of environmental biotechnology-based processes for water and wastewater treatment. They have revolutionized treatment of water for safe drinking, and refined purification of polluted water for release or reuse – all while minimizing the energy footprint". The professors' research has led to new processes for wastewater treatment currently being used around the globe. "Traditionally, we have just thought of pollutants as something to get rid of, but now we're beginning to see them as potential resources that are just in the wrong place," says Professor Rittmann. In his research he has studied how microorganisms can transform organic pollutants to something of value to humans and the environment. "We're in the middle of a paradigm shift, with more and more focus on how we can create resources, using microbial systems," he says. Professor van Loosdrecht's work echoes this sentiment. His research has led to increasingly common wastewater treatment processes that are less costly and more energy efficient than traditional methods. "With current technology, you can already be energy neutral and there is a lot of research on how to become energy positive. Especially in developing countries with unstable electricity supply and limited access to funding, this is very important. If we could build a wastewater plant that is self-sufficient in energy, that would make sewage plants feasible in many more places," says Mark van Loosdrecht. "Together, Professors Rittmann and van Loosdrecht are leading, illuminating and demonstrating the path forward in one of the most challenging human enterprises on this planet – that of providing clean and safe water for humans, industry, and ecosystems," says SIWI's Executive Director Torgny Holmgren. Professor van Loosdrecht's research has led to the quite widely used Anammox and Nereda technologies for wastewater treatment. The Anammox process is a resource efficient way to remove nitrogen from wastewater. In industries it is used after anaerobic wastewater treatment while in municipal wastewater treatment it is used in combination with sludge digestion. In both cases this results in an energy producing treatment process. The Nereda technology is based on granulation of bacteria, which allows a simpler and cheaper municipal wastewater treatment process. A Nereda plant can be built on a smaller patch of land (>60 per cent less area need) and uses up to 50 per cent less energy than conventional methods. Recovery of high performance biopolymers from the 'waste' sludge will contribute to a future more circular economy. Initially founded by the Stockholm Water Foundation to encourage research and development of the world's water environment, the Stockholm Water Prize is supported by the Royal Swedish Academy of Sciences, International Water Association, Water Environment Federation and the City of Stockholm. The Founders of the Stockholm Water Prize are companies united in their strong conviction to drive sustainability in the water sector. They are Bacardi, Europeiska ERV, Poul Due Jensen Foundation, Ragn-Sells, Water Environment Federation, Xylem and Ålandsbanken. Stockholm International Water Institute (SIWI) is a water institute. We leverage knowledge and our convening power to strengthen water governance for a just, prosperous, and sustainable future. SIWI focuses on a range of research and development topics within and around water that support decision-makers world. World Water Week is the world's leading annual water event, the Stockholm Water Prize the most prestigious water award, and the Stockholm Junior Water Prize fosters future generations of water excellence. We believe that the best way to tackle water crises, and help bring about lasting change, is to strengthen water governance among public and private actors alike. Essentially, who gets what water, when and how, and who has the right to water and related services, and the associated benefits. SIWI's strong, international team of knowledge-generators, convenors, facilitators, and trainers works to strengthen the systems and processes that govern access to and protection of fresh water, with the overarching aim to contribute to poverty eradication.